Can you confirm these amateur observations of Homopus areolatus? Type locality: "Indien" (in error). Diagnosis Diagnosis of the genus Homopus (from Branch 2007): small African tortoises with the triturating surfaces of maxilla and premaxilla without ridges; maxillary not entering roof of palate; prootic narrowly exposed dorsally; quadrate enclosing stapes; centrum of third cervical biconvex; carapace without hinge; no submarginal scutes; gulars divided; and gular region only slightly thickened (Auffenberg 1974). In addition to these features, the Aus tortoise (Homopus solus) possesses the following suite of characters that confirm its generic assignment to Homopus, and distinguish it from other tortoises in southern Africa: carapace depressed, with a distinct nuchal (c.f. Stigmochelys), paired gulars (c.f. Chersina) that are broader than long (c.f. Psammobates), and without a carapace hinge (c.f. Kinixys). Comment Illustration in Elaphe 8 (4): 3 and Elaphe 10 (1): 23 . Type Species: Testudo areolata THUNBERG 1787 is the type species of the genus Homopus. Greig, J.C., and P.D. Burdett. 1976. 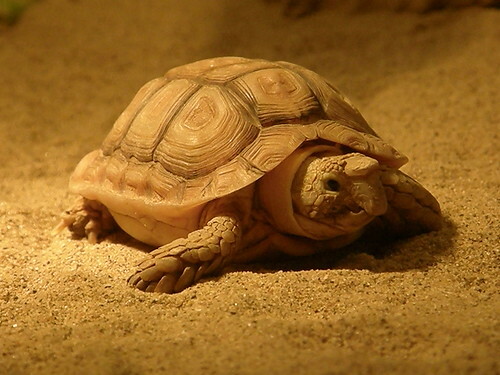 Patterns in the distributions of Southern African terrestrial tortoises (Cryptodira: Testudinidae). Zool. Africana 11(2): 250-267.